Send A Message To Colleen. Session Fees: $120 per 50 minute session. Life can be overwhelming, leaving you feeling helpless and alone. It is not easy to find your way forward. Recreating yourself in a way that embraces who you are and where you've been, to empower you to move towards a life you may envision, is not simple but it can be done. My goal is to help you find this path. Whether faced with a lifetime of challenges, or impacted by a single traumatic event, I bring empathy, compassion and understanding to the relationship. From that place of safety, I will support you to find the road to acceptance, healing, and peace of mind. 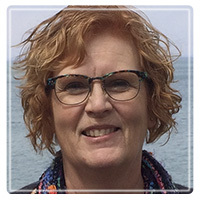 With over 30 years of experience and training as an educator, researcher, and therapist, I bring a wide variety of knowledge and experience to my clients. I am a Registered Psychotherapist, trained in Relational Psychotherapy, with additional training in Grief Therapy, Positive Psychology, Acceptance and Commitment Therapy, and Compassion-Focused Therapy. I am a lifelong learner and actively engage expanding my skills and approaches to working with clients in need. My training, in combination with lived experience of trauma and loss, has led me to a focus on the issues of grief and bereavement, trauma, depression, and anxiety. My approach is relational, strengths-based, and capacity-building. In taking this approach, I help people to move towards creating a meaningful life. I purposefully create a space where clients feel safe, valued, and heard, knowing that feeling alone with the struggles of life can be overwhelming. I am willing to walk alongside my clients as they find their way forward. Additionally, my background in Therapeutic Recreation, a profession that focuses on the role of free time engagements in creating a meaningful life, is one of the foundations of my practice. I believe that finding experiences in life that create positive emotion and express or develop personal strengths support feeling better, moving forward, and living well. It is hard to feel bad when you are doing something that uses or develops your natural gifts and talents. Finding those experiences with clients is important to learning to live a happier life. My office is centrally located in St. Catharines ON with convenient street parking available. My address is 14 Duke St., St. Catharines ON (905)401-3694. My fees are $120 per 50 minute session and I may be able to provide a sliding scale for clients with demonstrated financial need. I will also provide a receipt that can be submitted to your insurance company.